It could have been a chief’s treasure box, but probably belonged to a shaman and held all of his belongings. This is the size he could have afforded. It must have been old even when it was collected, and was heavily used. Decorated chests to hold blankets, provisions, and ceremonial regalia lined the walls inside traditional Tsimshian houses. Smaller telescoping boxes like this one have lids that fit snugly over an inner lip and were used to protect the most valuable or spiritually powerful treasures. They were tied with rope and sometimes covered with cedar-bark matting. In oral tradition the Chief of Heaven kept the sun in just such a box until Raven stole it and smashed it open at the mouth of the Nass River, bringing daylight to the world. 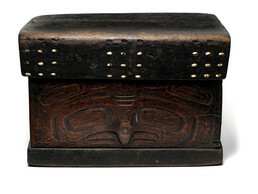 The panels on this Gitxsan treasure box depict Eagle and Beaver crests of the Eagle clan (Laxsgiik).